For a thousand generations, human beings viewed themselves as part of the wider community of nature, and they carried on active relationships not only with other people but with other animals, plants, and natural objects (including mountains, rivers, winds, and weather patterns) that we have only lately come to think of as 'inanimate.' How, then, did humans come to sever their ancient reciprocity with the natural world? What will it take for us to recover a sustaining relationship with the breathing earth? 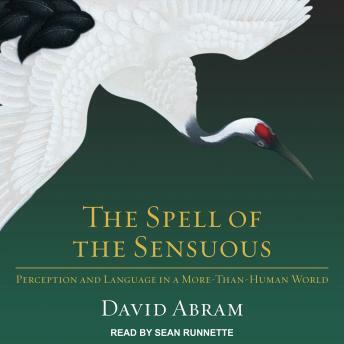 In The Spell of the Sensuous David Abram draws on sources as diverse as the philosophy of Merleau-Ponty, Balinese shamanism, Apache storytelling, and his own experience as an accomplished sleight-of-hand magician to reveal the subtle dependence of human cognition on the natural environment. He explores the character of perception and excavates the sensual foundations of language, which-even at its most abstract-echoes the calls and cries of the earth. In this lyrical work, Abram weaves his arguments with a passion, a precision, and an intellectual daring that recall such writers as Loren Eisleley, Annie Dillard, and Barry Lopez.